In 1918, after 200 years of St. Petersburg’s time as Russia’s capital, the Bolsheviks returned this leading role to Moscow. This is how the city looked like that year. Gold-domed Moscow became Russia’s capital in the 14th century. The massive white (and later red) Kremlin walls were a symbol of its power. But Peter the Great decided to build his empire anew and abolish the ancient traditions of conservative Moscow with its long-bearded boyars. So he shaved all those beards and raised up St. Petersburg, to where the capital was moved in 1712. When the Romanovs fell from power, the Bolsheviks decided to return to the old red city – completely the antithesis of ‘disgusting’ aristocratic Petersburg with its decadent palaces. 1. 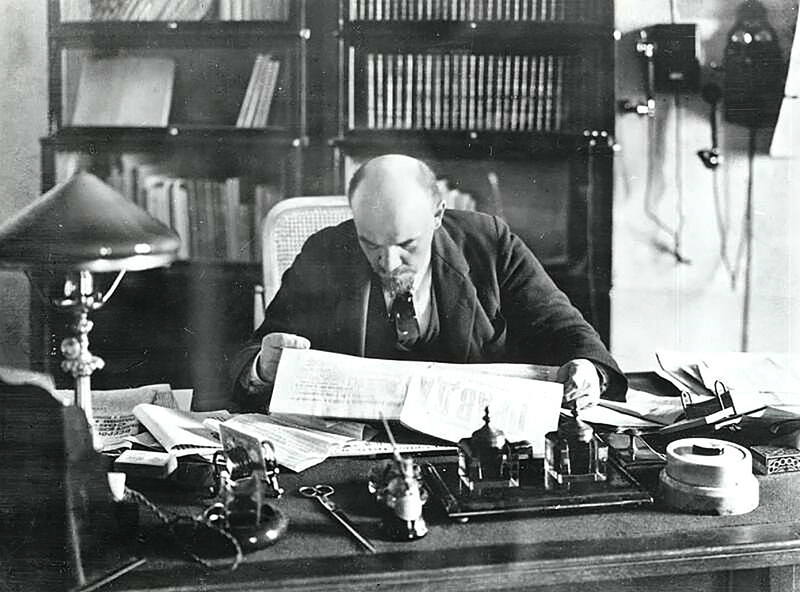 On March 12, 1918, Vladimir Bonch-Bruyevich, the secretary of revolutionary leader Vladimir Lenin, and the new government manager, signed an official decree moving the capital to Moscow. In this photo you see Lenin already in his Kremlin cabinet. There are legends that Lenin left Petrograd secretly in a deliberately darkened train. 2. The scale of this move is hard to imagine, and it was not only government workers changing their work place from Smolny Institute to the Kremlin, but the staff of all the ministries had to move their families, with all their personal belongings even including heavy personal libraries. 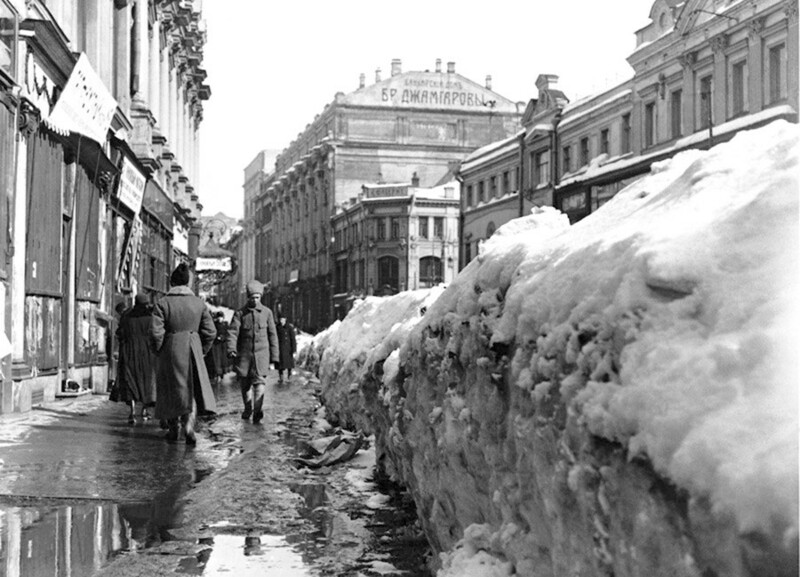 The photo is early spring 1918 in Moscow. 3. 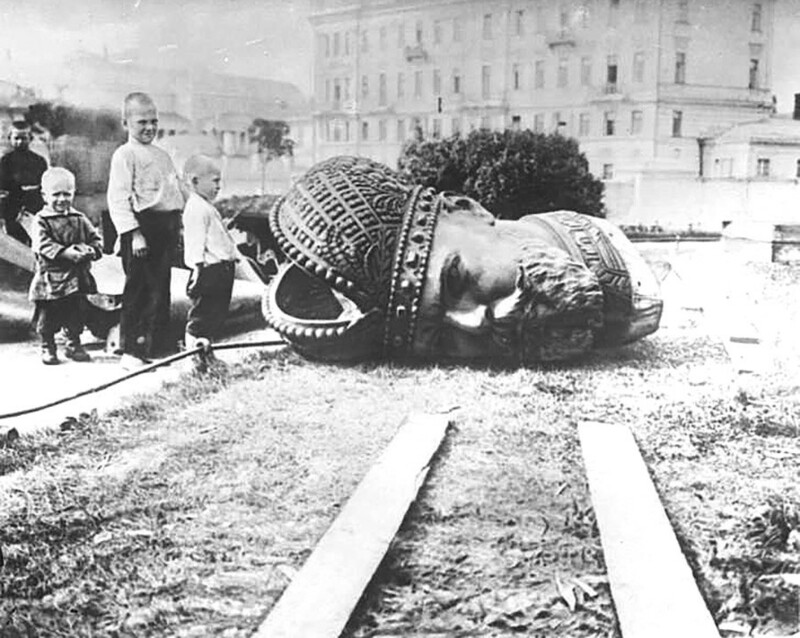 The first thing that the Bolsheviks did in Moscow was to arrange new rules and destroy the old power symbols. They demolished a huge monument of Tsar Alexander III, father of Nicholas II, which stood next to Christ the Savior Cathedral. Later, Stalin destroyed the cathedral. In the 1990s, however, it was built anew, and now a monument of Tsar Alexander II stands nearby. 4. 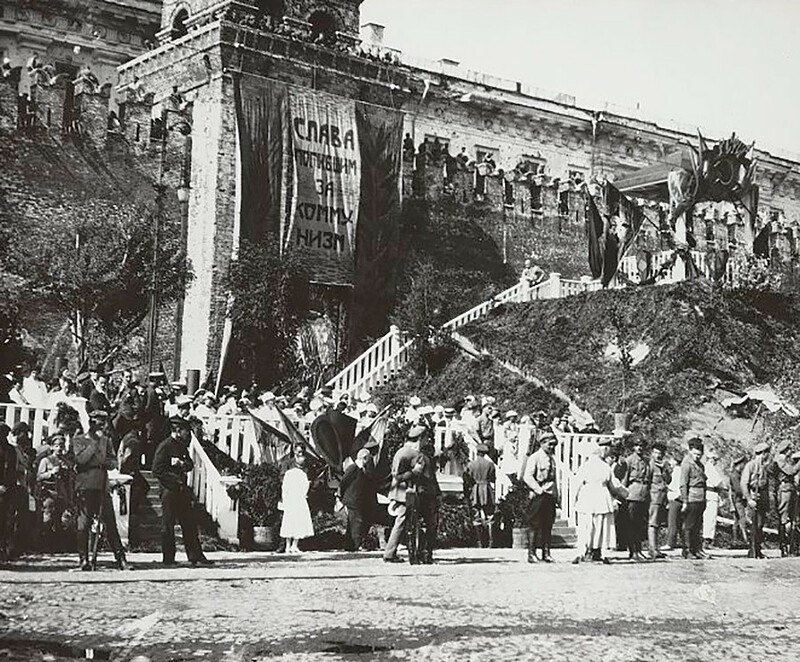 The Kremlin walls were decorated with Bolshevik symbols commemorating those who died fighting for communism. Later, the Kremlin walls became a favorite grave for Soviet leaders and those praised by the new regime. For example, writer Maxim Gorky was buried their without the consent of his family, which was even denied a request to take some of his ashes. 5. 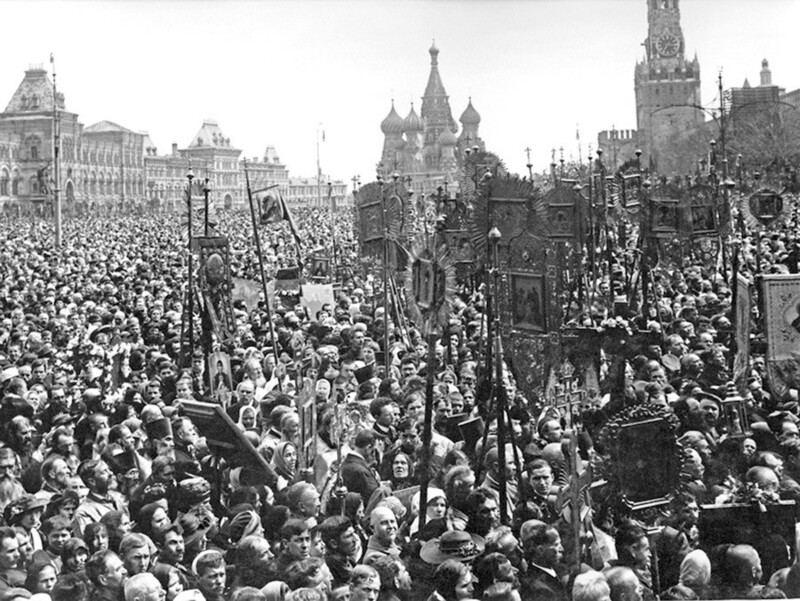 In May, Moscow’s Red Square saw a huge march celebrating Orthodox Easter. This was the time when the Bolsheviks hadn’t yet started their fight against religion. For more than seven decades the city didn’t again see such a large Orthodox celebration. Icons were replaced with red flags and Lenin’s portraits, and there were new street demonstrations in May, but this time to mark Labor Day. 6. Leon Trotsky’s plan to destroy the Orthodox Church in Russia began in 1922. 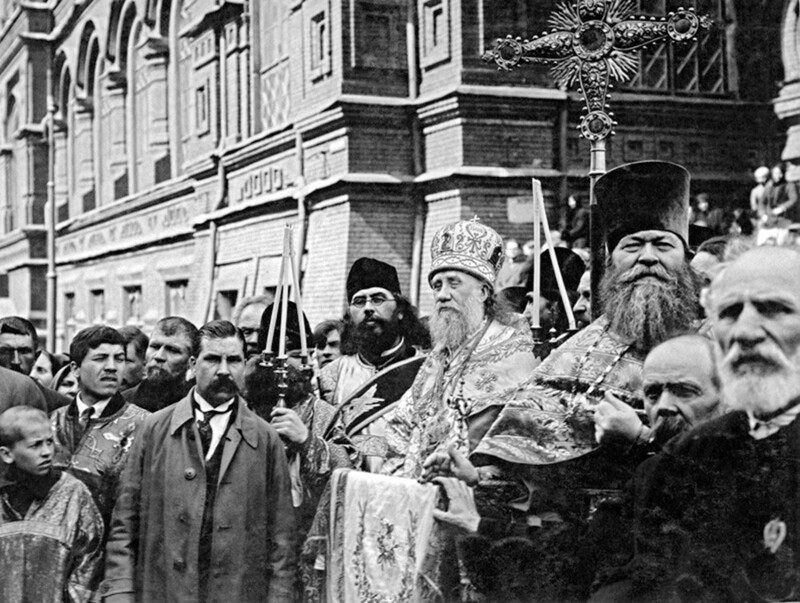 Patriarch Tikhon (pictured center during 1918 Easter celebrations) was arrested but not executed probably only because of the great influence he had. By the way, for a long time he served in Alaska, U.S. and Canada, and even established the first Orthodox Theological Academy there. He died in 1925 after suffering much humiliation at the hands of the Bolsheviks and the ransacking of his house, but he served dutifully until the very last days. During World War I, he blessed troops going to the front. 7. 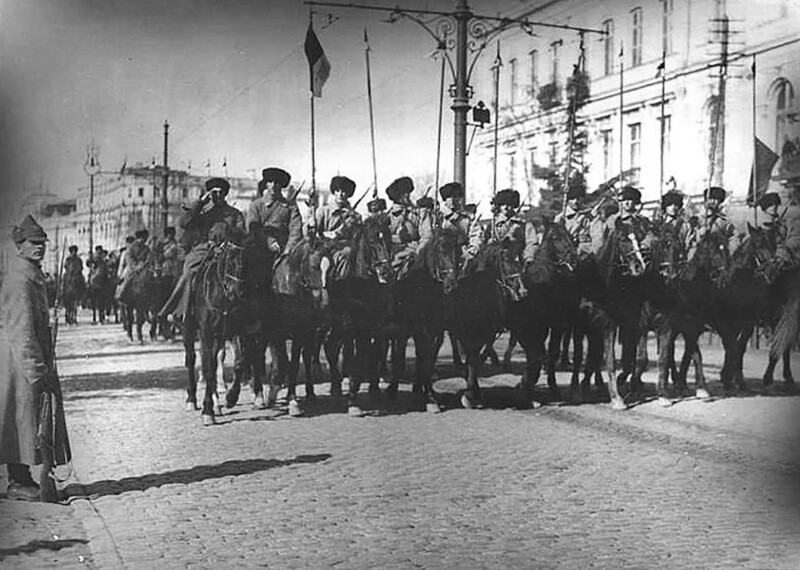 It’s important not to forget that while the Bolsheviks were moving the capital and official state organizations, the Civil War continued to rage. 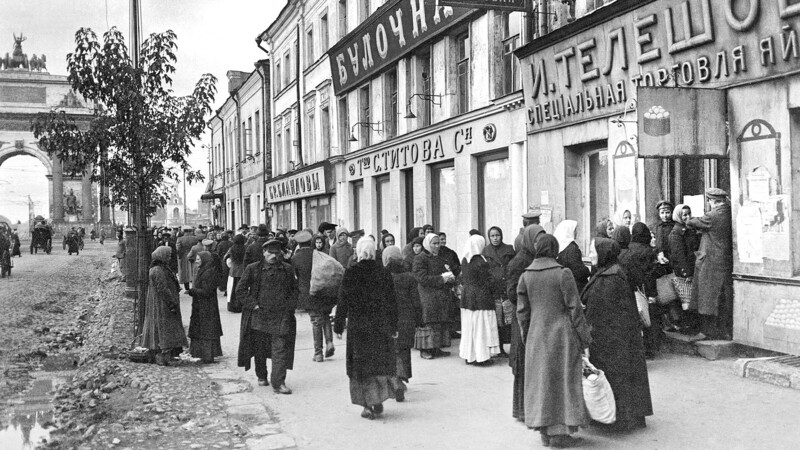 State officials confiscated grain and goods from peasants, distributing them free to the workers. There were endless lines for food, and famine began and didn’t end until 1922. 8. Here, the Red cavalry is making its way to the front. At this time, White General Kolchak was resisting the Bolsheviks and established an unofficial capital in the Siberian city of Omsk, but he was eventually defeated. The Revolution, Civil War and Bolshevik terror led to the deaths of 12-15 million people in 1917-1922. In comparison, the U.S. Civil War took the lives of just under 1 million. 9. Parliamentary opponents of the Bolsheviks, the SRs (Socialist-Revolutionary Party), were strongly against the peace announced in the Treaty of Brest-Litovsk, which was signed in March between the new Bolshevik government and the Central Powers of Germany, Austria-Hungary, Bulgaria and the Ottoman Empire. The SRs considered the terms unacceptable and shameful, and started an uprising that made Lenin nervous. But they were defeated with artillery, and their party was outlawed. 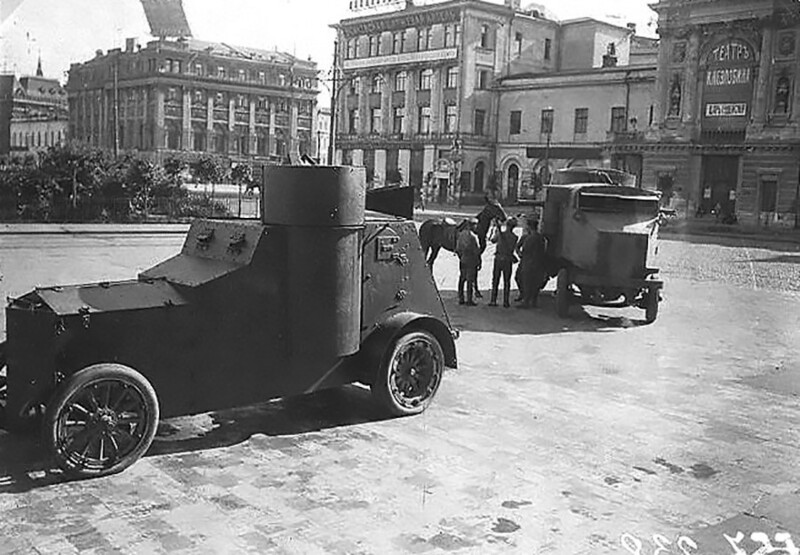 This photo shows central Moscow after the uprising. 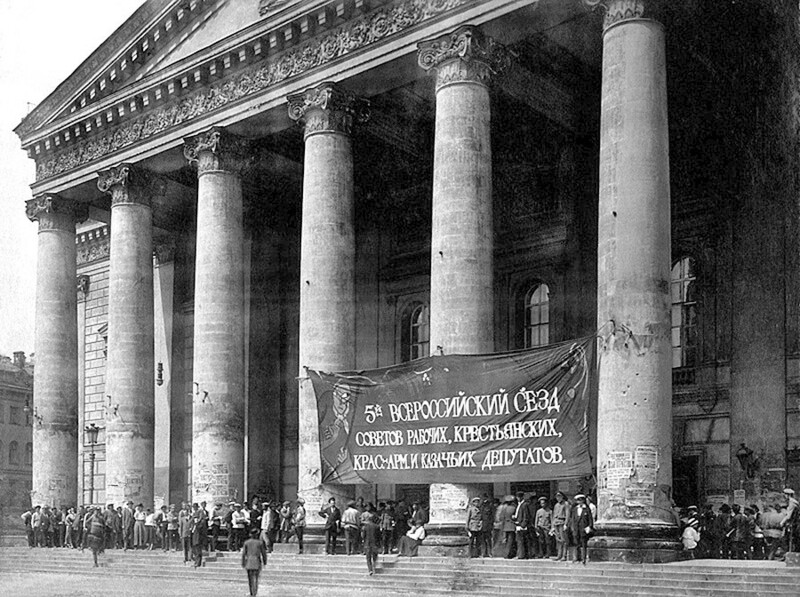 Find out here everything you ever wanted to know about the Russian Revolution. Admiral Kolchak: A true Russian patriot or a British intelligence agent? Who started the Civil War in Russia?